FILE - Palestinian Hamas gunmen ride on the back of a truck as they patrol the border with Israel near the southern Gaza Strip town of Khan Younis, as Israeli military bulldozers are seen in the background, June 10, 2015. 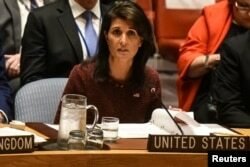 The United States failed Thursday to win condemnation of the Palestinian militant group Hamas in a vote at the U.N. General Assembly. Before considering the U.S. measure, member states voted to require a two-thirds majority to pass it, as opposed to a simple majority. The U.S. fell short of the necessary votes, despite strong support from the European Union — all of the bloc's members voted for it. "The question before us now is whether the U.N. thinks terrorism is acceptable if, and only if, it is directed against Israel," U.S. Ambassador Nikki Haley said ahead of the vote. FILE - U.S. Ambassador to the United Nations Nikki Haley delivers remarks at a security council meeting at U.N. headquarters during the United Nations General Assembly in New York City, Sept. 21, 2017. "Because there is nothing more anti-Semitic than saying terrorism is not terrorism when it is used against the Jewish people and the Jewish state," she said. "There is nothing more anti-Semitic than saying we cannot condemn terrorism against Israel, while we would not hesitate for a minute to condemn the same acts if they were taken against any other country. "I want to ask my Arab brothers and sisters is the hatred that strong?" Haley continued. "Is it so strong you will defend a terrorist organization?" Israel's U.N. ambassador praised the "plurality of member states that stood by the truth and condemned Hamas," but he had harsh words for those which rejected the measure. "Your silence in the face of evil reveals your true colors," Danny Danon said. "It tells us what side you are really on: a side that doesn't care about the lives of innocent Israelis and Palestinians who have fallen victim to the terrorists of Hamas." "We reject cynical attempts to reduce the Palestine question to a matter of violence and terror," said Ambassador Riyad Mansour. "This is a political, territorial and human rights issue. It is an issue to end occupation." While the U.S. measure failed to be adopted, a second draft put forward by Ireland, reiterating the call for a "comprehensive, just and lasting peace" based on existing U.N. resolutions, was overwhelmingly adopted.